The Gulf of Mexico is one of the nation’s greatest natural resources. Harboring over 50% of our coastal wetlands, the Gulf hosts a multitude of critical species and habitats in addition to being an economic resource that produces 27% of domestic oil and over 1.2 billion pounds of seafood annually. However, Gulf recovery and sustainability is hampered along the coasts of Texas and Louisiana in the “hypoxic zone” where oxygen in the water is so low that fish and shrimp cannot thrive. What is destroying these nationally important fisheries in an area of ocean the size of Connecticut (about 6,000 square miles)? Nutrient pollution from the Mississippi River fuels loss of oxygen in the Gulf of Mexico Hypoxic Zone. Credit: NOAA Environmental Visualization Lab. How does land use in the Midwest degrade fisheries in the Gulf of Mexico? Nutrient loading from farming and inadequate wastewater treatment far up the Mississippi River is a primary contributor to oxygen depletion in the Gulf, according to researchers at the U.S. Geological Survey and NOAA. Fertilizers applied to farm fields wash off into the local waterways that flow into the Mississippi River. Nutrients support plant growth on the land and in the water. When these fertilizers reach the Gulf of Mexico, algae grows over unusually large areas. Whether in farm ponds or the ocean, overabundant dying algae “burns” oxygen as it decomposes, creating an area where aquatic life suffers. Farming is expanding across the Mississippi Basin in response to global demand for food, fiber and fuel. Generations of traditional cropping practices in the Midwest and lower Mississippi Alluvial Valley left fields bare and eroding in the winter, flushing large amounts of valuable nutrients down to the Gulf of Mexico. More recently, large swaths of grasslands in the Great Plains have been converted to row crops to boost corn ethanol production. As these fields are plowed up, drained and planted, more fertilizers are applied and run off into local waters, exacerbating declines in water quality both locally, as well as a thousand miles downstream. Habitat for grassland birds and waterfowl in wetlands is lost. Grazing lands that supported livestock production and ranching cultures disappear. 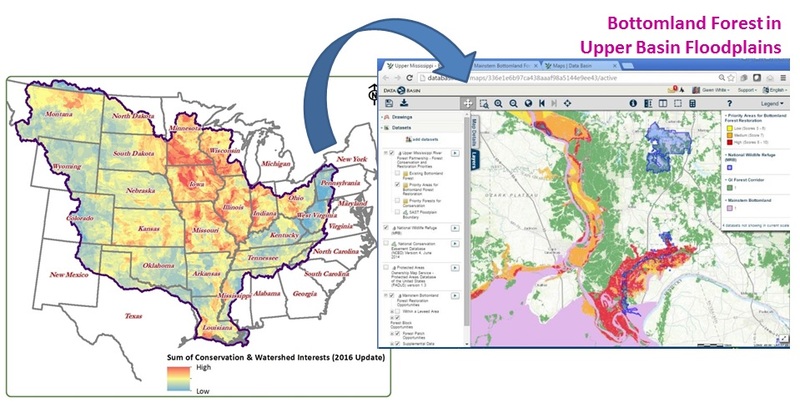 Stakeholders developed a publicly-accessible online spatial analysis (Precision Conservation Blueprint v1.0) to locate key regions for connecting and enhancing wildlife habitat on marginal agricultural lands across the Mississippi Basin and at higher resolution in pilot watersheds of the Midwest and Mississippi Alluvial Valley. How can we align our mutual interests across such enormous scales? In a new model for collaboration, seven Landscape Conservation Cooperatives (LCCs) are convening dozens of agencies and organizations across large regions to align their individual missions and solve multiple problems at the same time. The multi-LCC Gulf Hypoxia Initiative is a joint strategy that focuses conservation action in locations that address basin-wide concerns like water quality, migratory pathways and climate adaptation. Prairie STRIPs is an example of a conservation action that provides benefits for wildlife, water quality and agricultural ecosystem services. By intentionally considering impacts on the objectives of other sectors, conservation practices can be designed and configured for multifunctional benefits. For example, strips of prairie at the edges of farm fields or along contours can support grassland birds, filter nutrients from run off, support integrated pest control and pollination of adjacent farm fields, and ultimately reversing the decline in ocean oxygen that is hampering recovery of the fish and shrimp in the Gulf. Native grasses can also produce feedstock for biofuels produced by digestion of livestock manure (http://roesleinalternativeenergy.com/project-to-convert-manure-into-energy-celebrates-milestone/). Other conservation practices from cover crops and control of tile drainage water to restoration of wetlands and floodplain forests can keep fertilizers in farm fields where they support lush crops while protecting downstream water quality for community drinking water and fisheries. This approach makes every conservation dollar count by maximizing its value for a larger constituency and in a larger context. How are stakeholders creating and using a blueprint to guide investment of conservation dollars? Researchers and managers across the LCCs have selected a dozen highly effective conservation practices and mapped areas across the Mississippi Basin where we can simultaneously protect wildlife habitat, reduce nutrient loads to the Gulf of Mexico, and benefit agriculture or bioenergy production. Translating the objectives from a stakeholder-driven framework, The Conservation Fund has compiled over 200 publicly-available datasets representing these interests to complete a first generation spatial analysis (Precision Conservation Blueprint v1.0) that identifies the most strategic and cost-effective places to invest conservation dollars under current conditions. In future versions, scenario planning could account for climate and land use adaptation strategies that will shape conservation actions in response to foreseeable ecological or economic drivers. 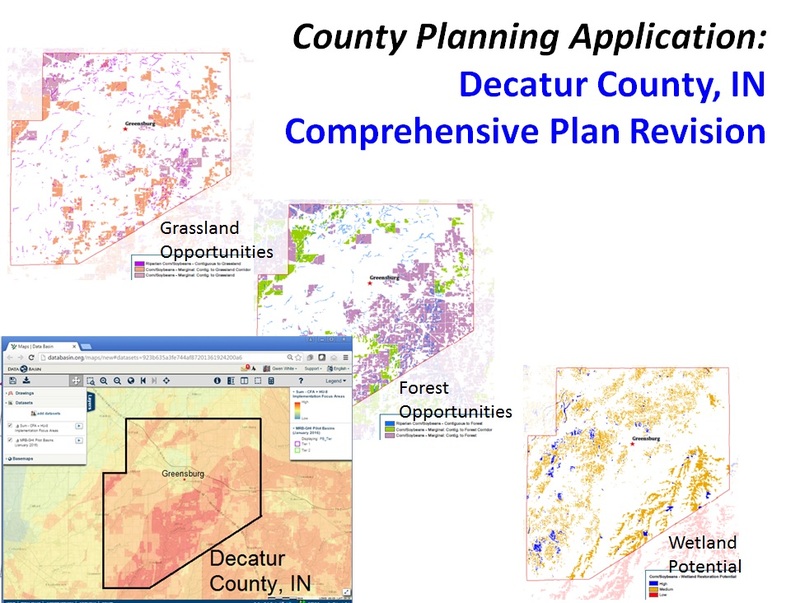 County planning example using Precision Conservation Blueprint v1.0 to identify local opportunities for prairie, wetland, and forest habitat that support larger Mississippi Basin multi-sector strategies while targeting conservation investment at the 30m resolution. The initiative plans to use this framework to enhance organizational capacity, avoid duplication of effort, streamline prioritization of conservation actions, and align the work of many agencies and organizations across multiple scales. Locally, stakeholders are working together to “test drive” this multifunctional planning approach across state borders in the Lower Wabash River Floodplains and in several other applications from county to regional levels. This effort is complementary to on-going efforts of the Gulf of Mexico Hypoxia Task Force, NRCS Mississippi River Basin Initiative, and state nutrient reduction initiatives – but with an emphasis on the ecological, agricultural and social values of wildlife habitat. We welcome your input on further refinement and use of these tools to support a multifunctional working landscape. How can I explore application of these targeting tools for my program? Read the background, view and download data layers that culminate in the Precision Conservation Blueprint v1.0 strategic spatial analysis at: <https://tallgrassprairielcc.org/issue/gulf-hypoxia>. For more information, contact Gwen White, Tallgrass Prairie LCC Science Coordinator, at [email protected] or 812-212-7455. 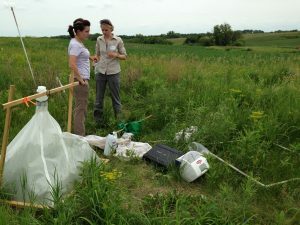 Gwen White serves as the Science Coordinator for the Eastern Tallgrass Prairie & Big Rivers Landscape Conservation Cooperative which facilitates a collaborative conservation effort that restores and connects wildlife with people on the rich soils of a functional working landscape across the cornbelt. 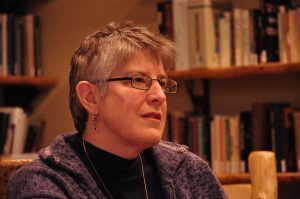 She earned her PhD in conservation biology from the University of Minnesota, an MS in zoology from the University of Maryland, and served with the U.S. Peace Corps aquaculture program in Honduras. She grew up working on a dairy farm at the edge of the Flint Hills in Kansas.